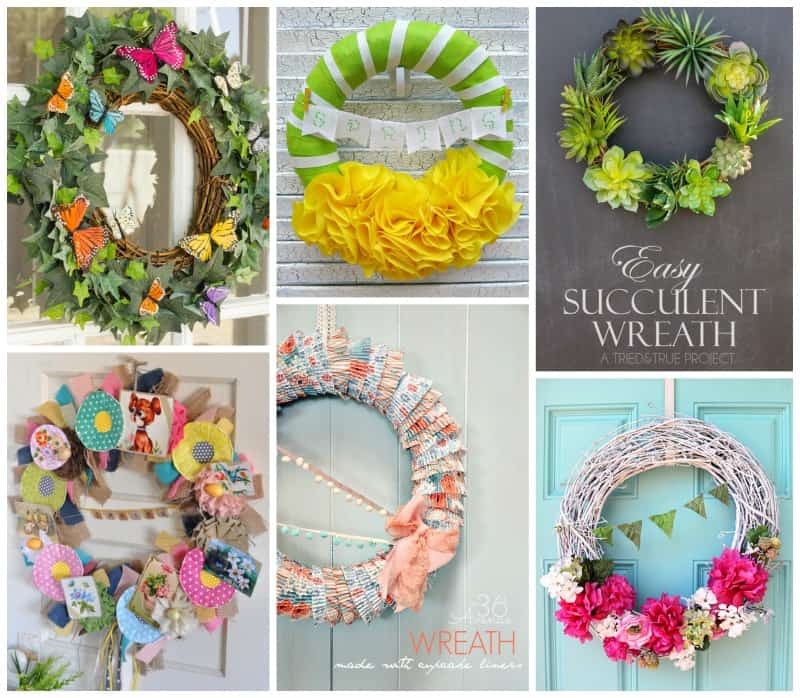 Spring Wreaths: 30+ DIY ideas from Easter, succulent, flower and recycled wreaths! The fresh smell of spring is approaching soon, and boy am I so ready for it! I love the vibrancy of all the pretty spring decor that pops up around everyone’s homes. It brings life to the dead plants and trees from winter and makes you feel renewed. These spring wreaths are perfectly pretty little staples to hang upon your front door. 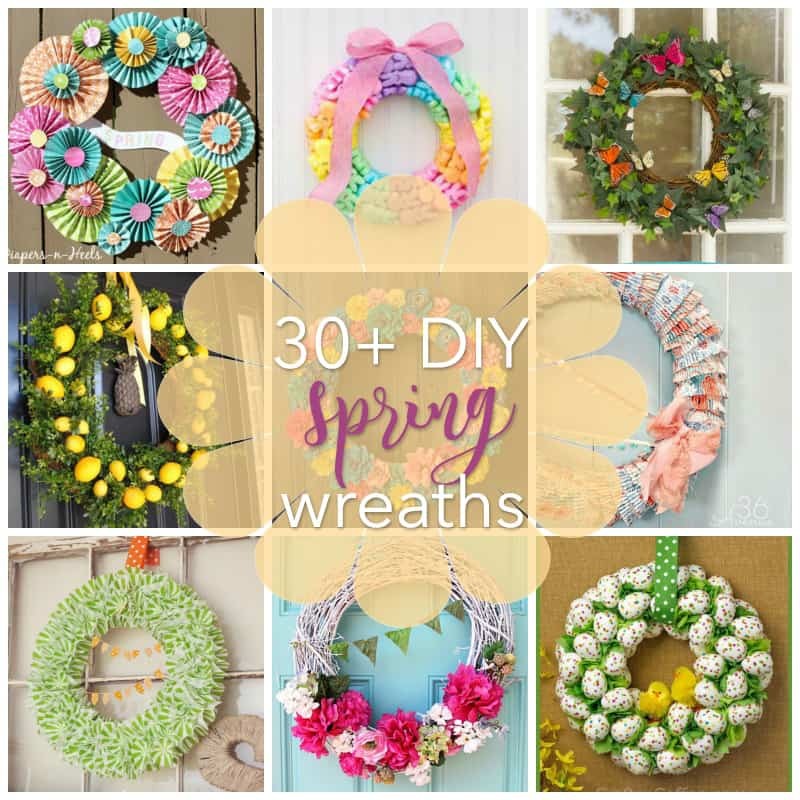 Welcome the warm weather in and craft up some DIY spring wreaths for yourself! Spring Butterfly Wreath – Oh I just LOVE the butterflies added to this Spring wreath! Vintage Spring Wreath – What clever take on a Spring wreath! Colorful Spring Wreath – The green and yellow are perfect for Spring. Reminds me of a flower. Cupcake Liner Spring Wreath – This cupcake liner wreath looks very elegant. Love the pastels. Easy Succulent Wreath – Succulents are perfect for anytime of the year! DIY Spring Wreath – This really looks like a simple wreath to make for Spring, love those kinds of projects! Felt Flower Wreath – This wreath will really make a statement on your front door! DIY Cotton Bloom Twig Wreath – I just absolutely love the look of this wreath, everything about it is perfect. Pebble and Succulent Wreath – This is a unique take on a wreath but I really like how it turned out. Spring Pinwheel Wreath – Now this is a festive wreath for Spring! Teacup Garden Wreath – What a cute idea adding the teacup to this Spring wreath. It would be great for a garden party too! 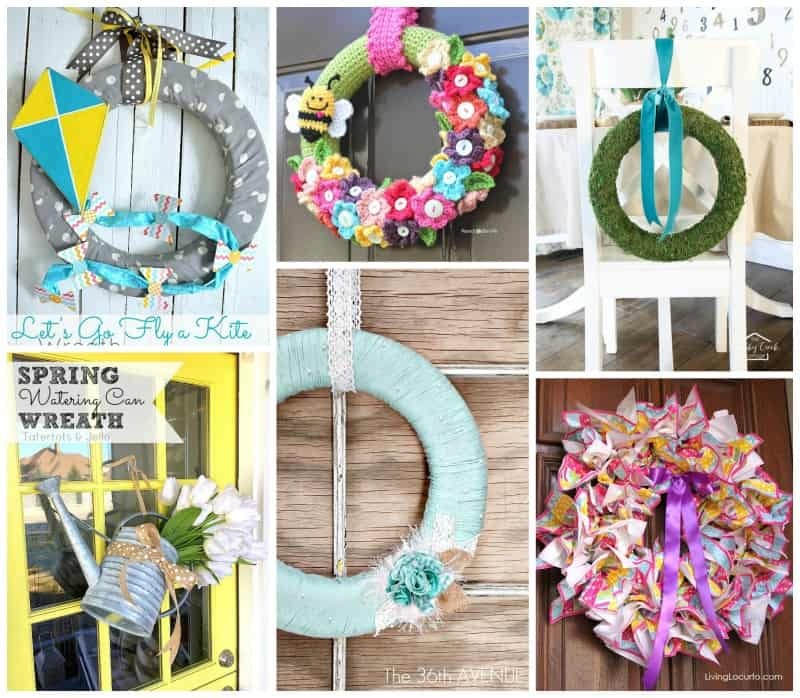 Let’s Fly a Kite Wreath – You totally get the Spring feeling when looking at this wreath. Spring Watering Can Wreath – This is not your traditional wreath, but I think it’s perfect! Crocheted Spring Wreath – This wreath looks like a lot of work, but I think it really makes a beautiful statement. Yarn Spring Wreath – Here’s a simple and very elegant wreath made from yarn. Moss Wreath – Moss wreaths are the best, they seriously can work for any season. Especially Spring! Napkin Wreath – Now this is a pretty interesting take on a wreath. So many possibilities you can do for every holiday/season. Crepe Paper Flower Wreath – The bright pink is great for this wreath and I think it’s pretty cool to wrap the wreath in crepe paper. Coffee Filter Wreath – Coffee filters are very inexpensive so they make the perfect craft supply. Especially for a wreath project. Life Saver Spring Wreath – I love the coastal feel, and to make a Springtime wreath with the look of a life saver is awesome! Spring with Lemons Wreath – Decorating with lemons is my favorite, so seeing a lemon and boxwood wreath is pretty great! Coffee Filter Kids Wreath – Of course I had to add a kids craft to this roundup. Kids love making wreaths as well! Paper Flower Wreath – All these beautiful paper flowers are actually handmade. That’s pretty amazing! Split Pea Wreath – A foam wreath and a bag of split peas makes the cutest wreath ever! Spring Paper Flower Wreath – Another wreath using the moss and it looks fantastic! 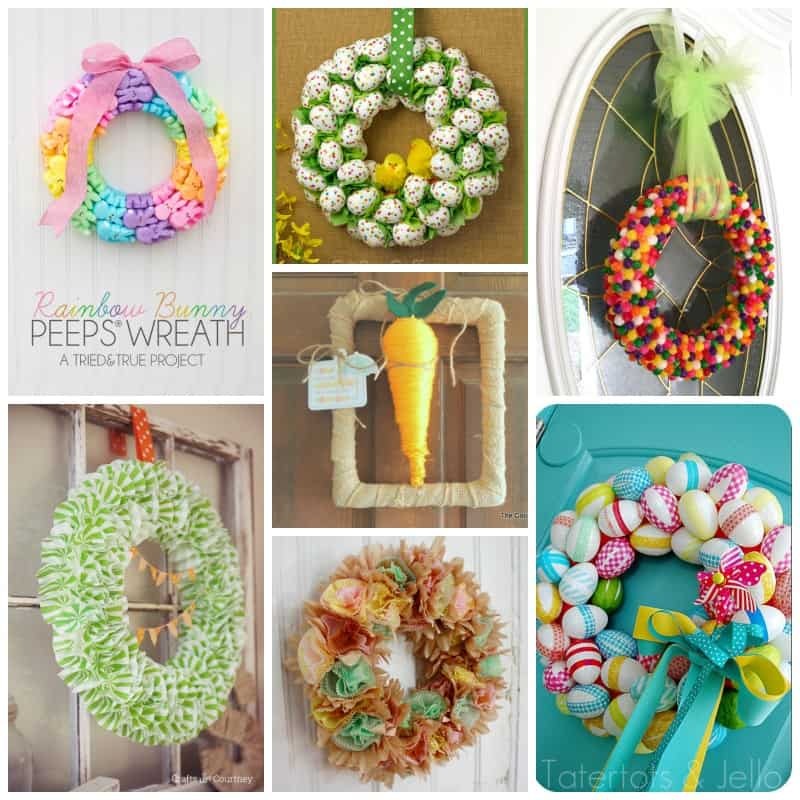 Bunny Peeps Wreath – This wreath looks absolutely adorable and delicious! Easter Cupcake Liner Wreath – I love the idea of using cupcake liners to make a wreath. Looks beautiful and full! Confetti Easter Egg Wreath – This Easter Egg Wreath will really brighten any area! Carrot Spring Wreath – You’ll never guess what the carrot is made of for this fun Easter wreath. Cupcake Liner Flower Wreath – Another cool take on a cupcake liner wreath. They actually made flowers too! Jelly Bean Spring Wreath – Keep this wreath away from the kids, it looks too good not to eat! Washi Tape Easter Egg Wreath – Of course, you have to use eggs to make a fun and festive Easter wreath! Love this one! NEW! 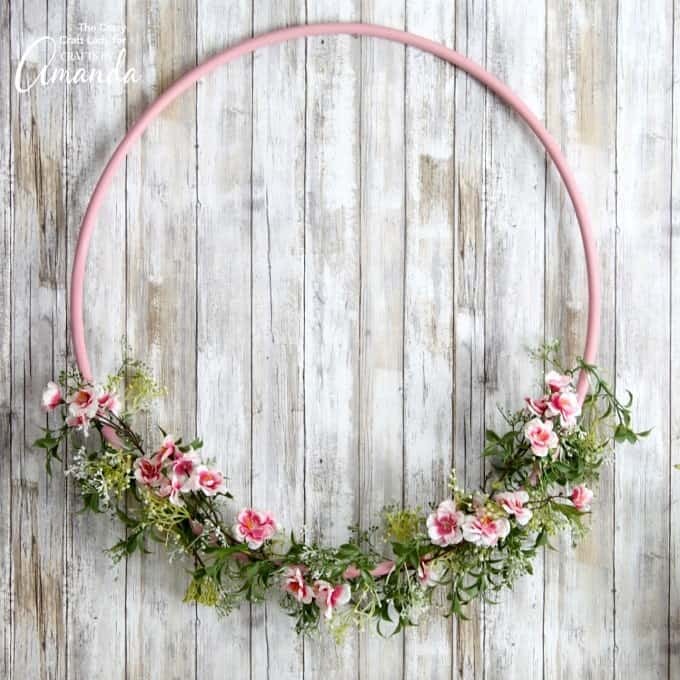 This hula hoop wreath is an awesome way to use an old hula hoop! Spray paint it to whatever color you’d like, add some greenery and flowers and you have yourself a pretty spring wreath. NEW! 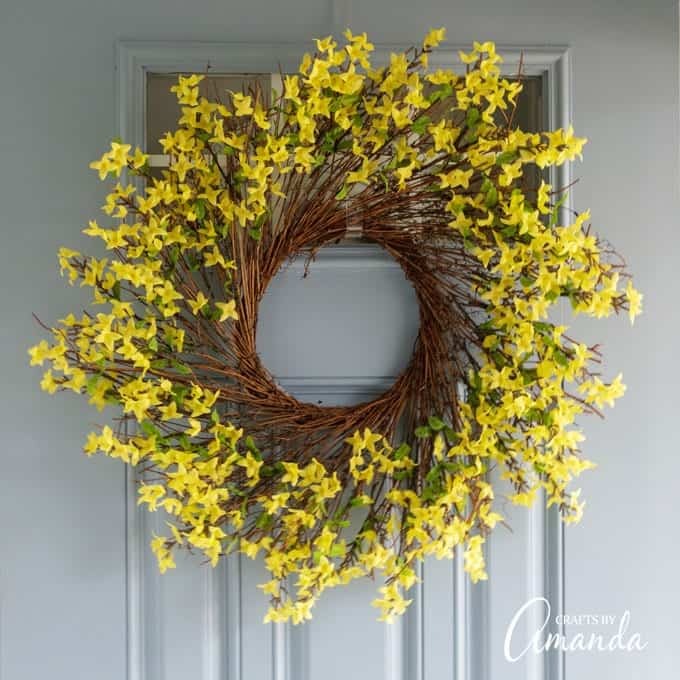 This beautiful DIY Forsythia Wreath adds a pop of vibrant color to your front door. Bringing in the feeling of cheery summer and spring colors! 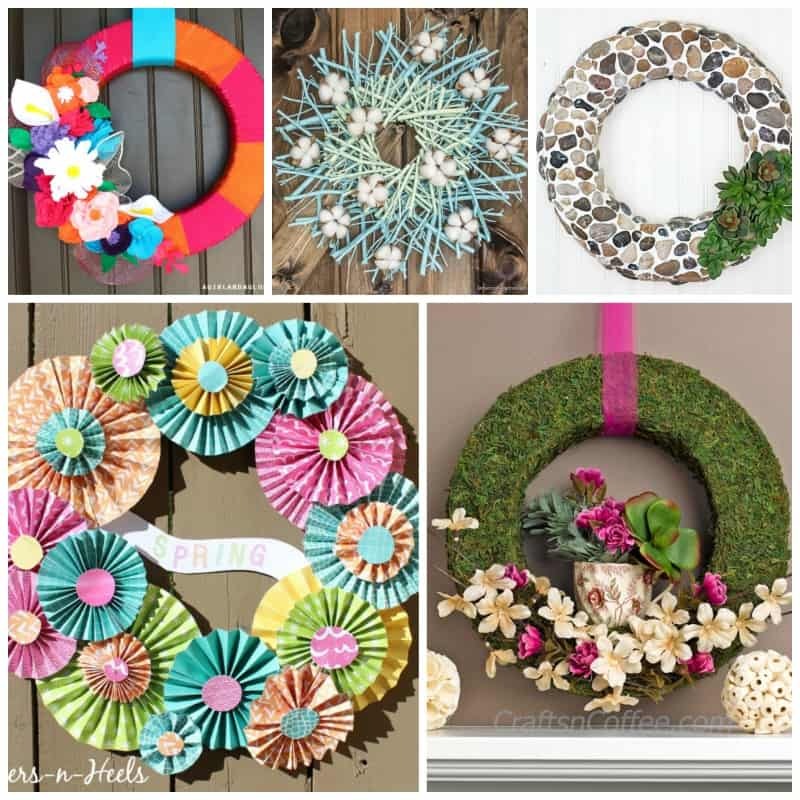 We hope you find some really great inspiration out of all these amazing DIY spring wreaths! You may also be interested in checking out 27 Fairy Garden Ideas, 26 Amazing Garden Craft Ideas, or 38 Beach Craft Ideas for Kids and Adults. What a great roundup! Thank you for including my sister’s jelly bean wreath! You bet, thanks for such a great project! 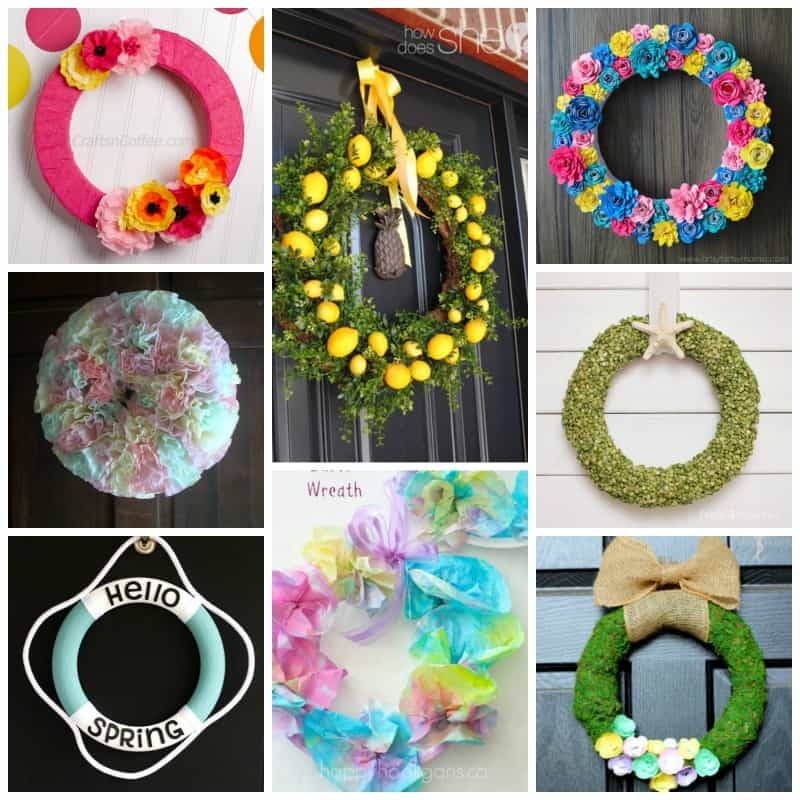 So many pretty spring wreaths! I love these wreaths that celebrate warm weather & sunshine. Thank you for including the wreaths from CraftsnCoffee.com, too! xo!